For something really easy and great when you want to cook a special meal, try this. 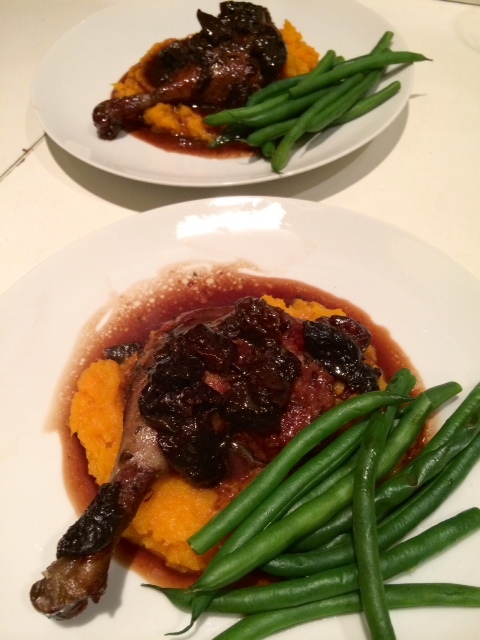 As you can see I served the duck with pumpkin and kumara mash and green beans. I had planned to have asparagus instead of the beans but didn’t get to Fresh Gardens stall quickly enough on Saturday morning!! You don’t have to be exact with quantities when making the sauce. Preheat the oven to 160-170°C. Trim any excess fat from the duck legs. Rub each with a little olive oil, salt and pepper and crushed fennel seeds. Place them in a flameproof oven dish and into the oven for about 45 minutes. Baste from time to time with the fat that comes out of the duck. Leave the oven on. Remove from the oven, set aside the legs and pour off most of the fat. Put the dish on medium heat on the stove top and add the shallots, carrot and celery. Brown them. Add the stock, bouquet garni and about 500ml of the wine. Simmer with the lid off until the liquid is reduced by at least half. This will take about 15-20 minutes. Strain the sauce to remove the vegetables and bouquet garni. Place the duck pieces back into the oven dish and pour over the sauce. While the wine and stock are reducing, place the prunes in a pot with the rest of the wine. Simmer for a few minutes. Add some cassis and/or sherry or port. This isn’t essential but adds an extra depth to the sauce. Pour this together with the prunes, over the duck pieces. Place the dish back into the oven and cook for about an hour. Baste from time to time.